Orpheus exist the scene and escapes the cops after giving one of the criminals a message for Rasputin. Back at his place he plans to visit the black gang. Batman arrived moments after Orpheus left and gets some more clues which he send to oracle and has her piece together what’s going on. He visits the new commissioner before visiting and threatening Rasputin. That night Orpheus warns the black gang not to pimp their women or sell drugs to their kids. Before he can finish scaring the gang Batman arrives. He tries to escape but gunshots ring out and he finds a dead man. Batman thinks it’s him and rushes in to finish him. Lots of action- We get a nice Gage of Orpheus skill as he dodges bullets saves police officers and takes out gang members all at once. He’s easily comparable in skill to the batman family. Orpheus then goes home and he’s clearly loaded with the kind of tech he has. Rasputin is another evil incarnate gangster but plays the role of villain well. 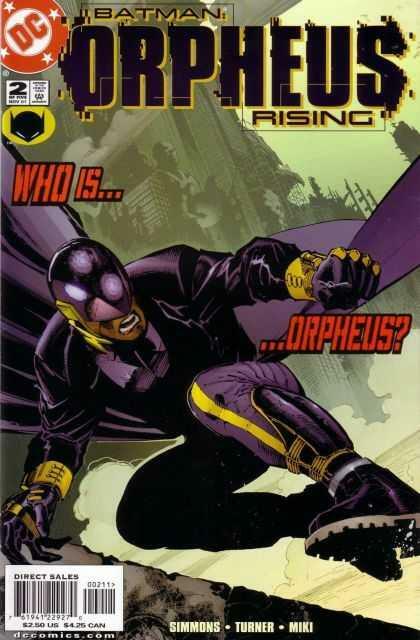 Orpheus is a worthy addition to the pantheon of black superheroes out there, if this great characterization keeps up he may enter my top five. Some “bat-god” types will scoff that someone has been able to pull the wool over bats eyes this long. Some may interpret what Orpheus says to the black gang as racist. They killed off Orpheus some years ago.